Automated workflow provides a collaboration platform for automating assignments, routing, decision-making, auditing and performance reporting. 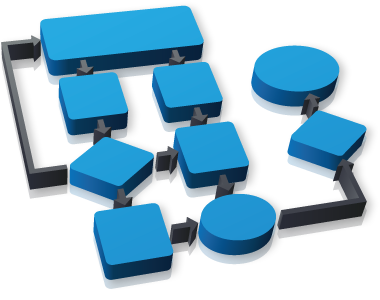 Automated workflow provides a set of configurable tools that can be used to automate business processes. Any application that requires decisions to be made by sharing documents and information is a good candidate for this type of automation. Typical applications that benefit from automated workflow include Vendor Invoice processing, HR hiring processes, Remote Coding applications and Loan Approval processes. In each of these processes, rules are configured once and applied to documents as they enter the system. Decisions are made based on the application of these rules at each step in the workflow. Within the workflow system, users become members of groups. These groups are assigned security levels, responsibilities and tasks to complete. Documents can enter a workflow either as a result of document scanning, importing, or through the creation of an electronic form. Automated workflow allows you to control operational costs, create accountability and increase your organization’s scalability.